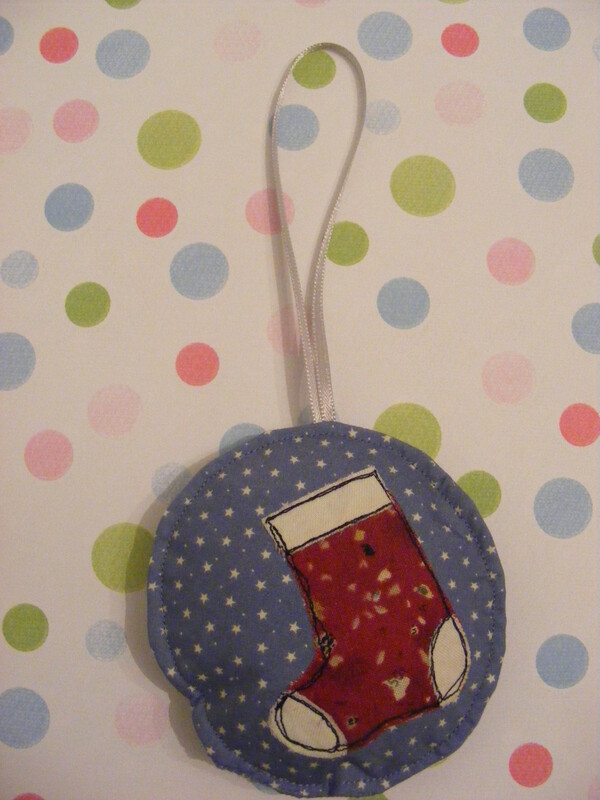 A little while ago I had a pincushion-making frenzy and here are the results. 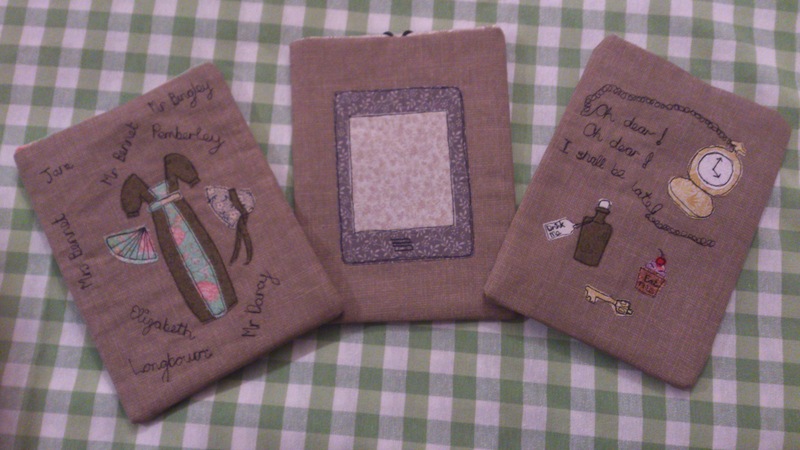 Just wanted to share the newest kindle/ipad mini cases with you. At the beginning of December I had a lovely weekend in Edinburgh with my girlfriends. We had a fabulous time and stayed in a lovely Georgian apartment. The view from the living area was outstanding. I can definitely recommend the Destination Edinburgh apartments at 20 York Place for any groups visiting this lovely city. Highlights of the visit were The Dome, The Olive Branch Bistro and Lord Bodo's Bar. Anyway, the actual point of this post was to tell you about the pressies I made for the girls to mark our visit. 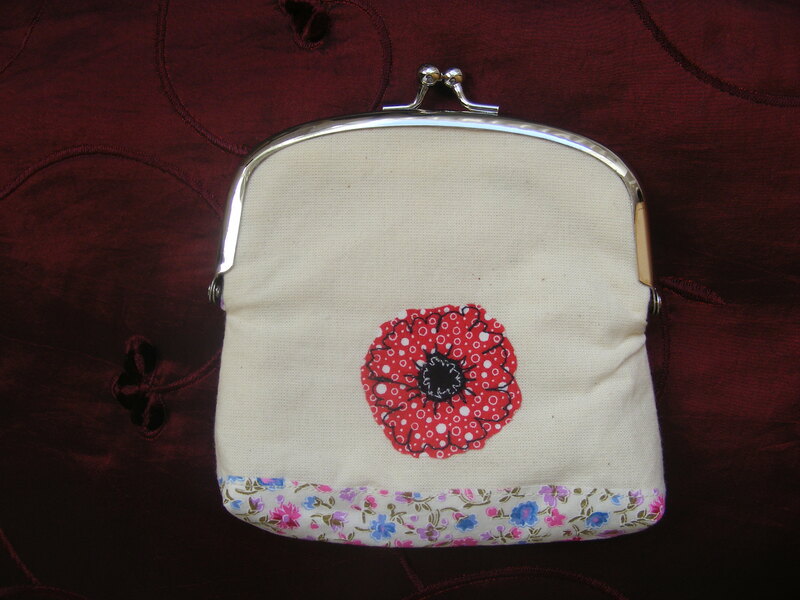 After much deliberation I settled on small purses/make up bags with detachable flower brooches all lined in complementary fabrics. 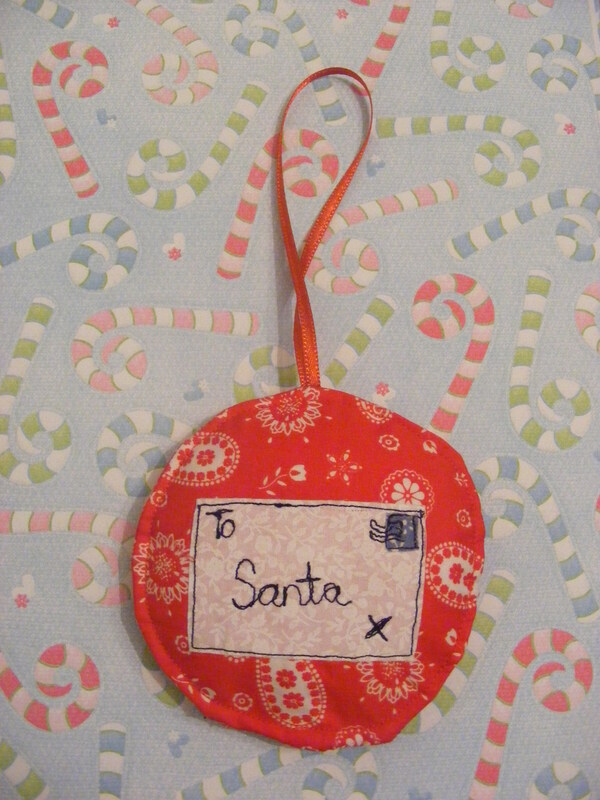 I really enjoyed making them and they were really well received. 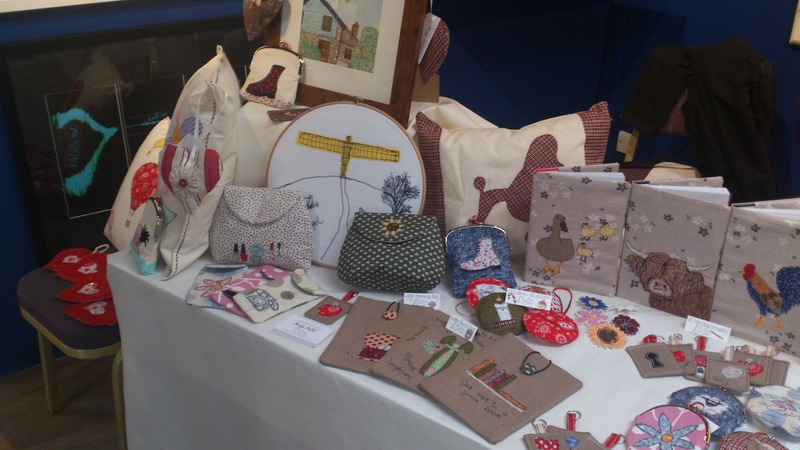 I've finally done my first craft fair.......and loved it! 12yo and I were delivered to Washington Arts Centre on Saturday and, once our stall was up and ready, a new shopping empire was born. Well perhaps not an empire but getting there. We had an out of the way stall but we still managed to attract customers. 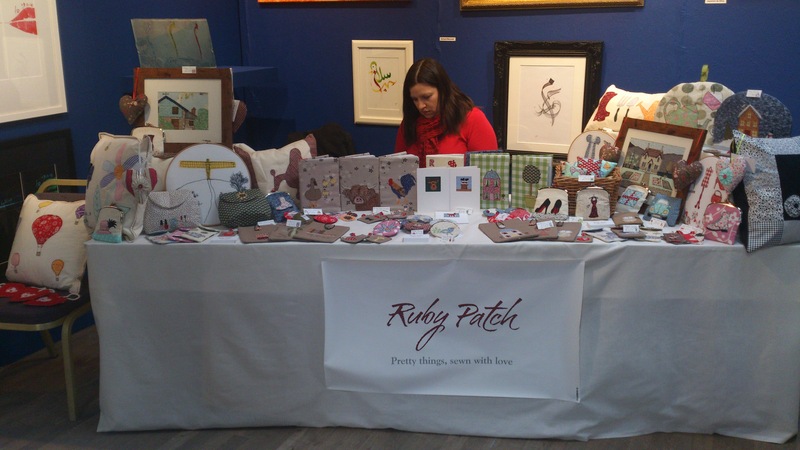 Most people were lovely and seemed to have a real interest in my products so I was definitely pleased about that. I wasn't actually feeling as grumpy as I look on this photo. I was caught at a bad angle. That's my story and I'm sticking to it. 12yo managed to take an active part in the selling and by lunchtime was encouraging me to take a break and have a wander around the stalls so that she could be left in charge. Alan Sugar could learn a thing or two from her. 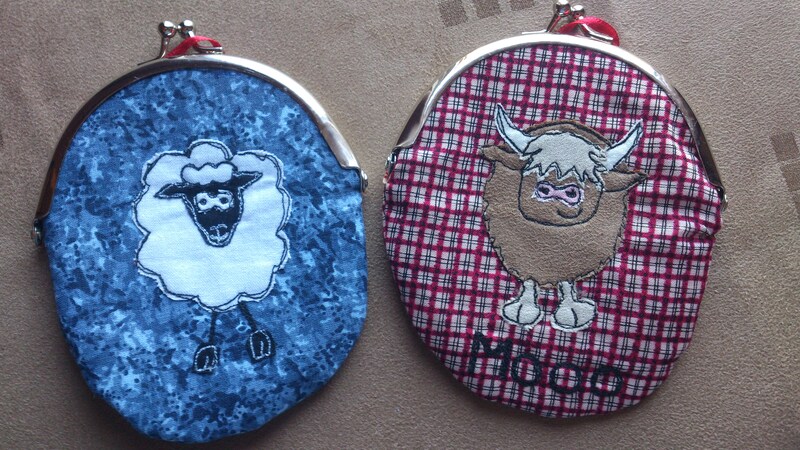 I found that my most popular items were those featuring highland cows and have even got a commission to make more. All in all, we had a lovely time and the people were really welcoming. We will be back on the 15th December for the Christmas fair along with Santa, mulled wine and a choir. Festive or what? Come and visit us. 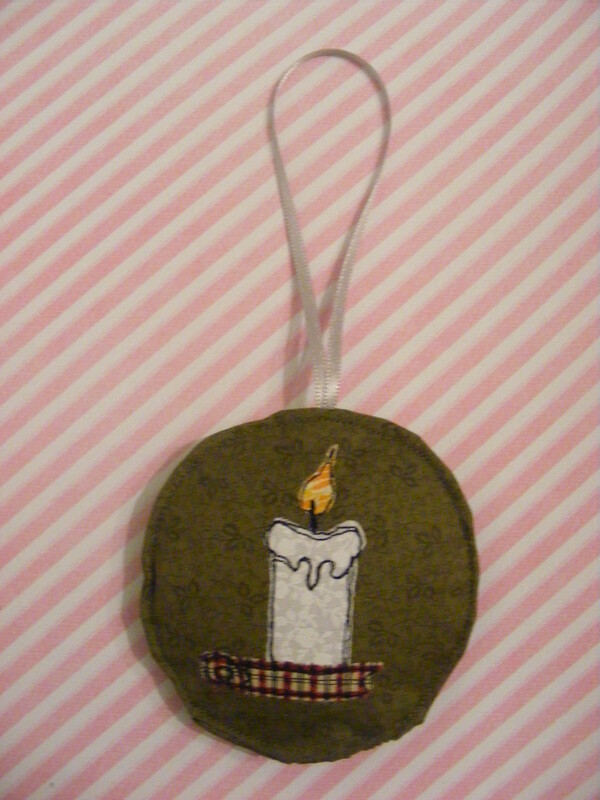 Since I committed to a couple of craft fairs before Christmas, I decided that it was about time I made something seasonal. 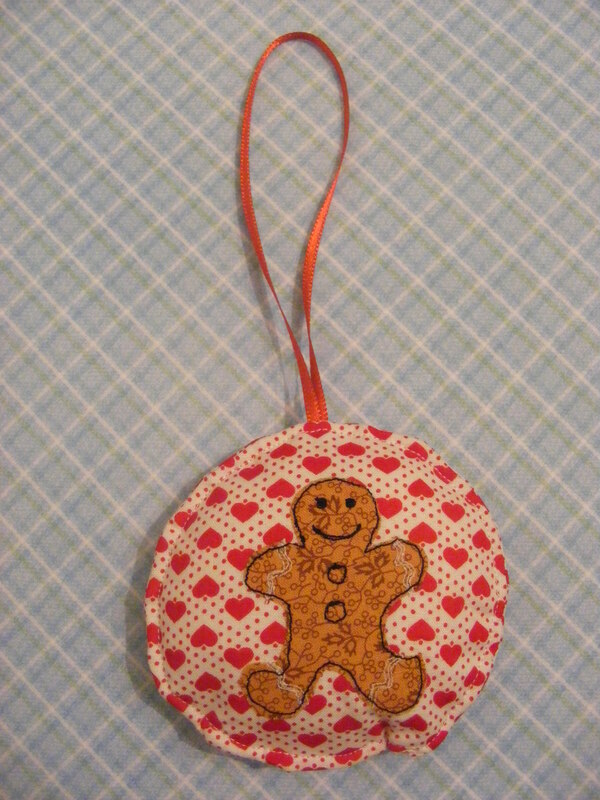 Tree decorations have been my first attempt. The circular shape was a great idea and worked well up until the point where I turned then right side out and filled them. Sewing up the final seam proved to be a real pain and, even after the eighth one, I still had real problems getting the curve to look tidy. All in all, I don't think I'll be making any more of them. After running out of ideas, I asked the kids what they would like to have on a little purse. 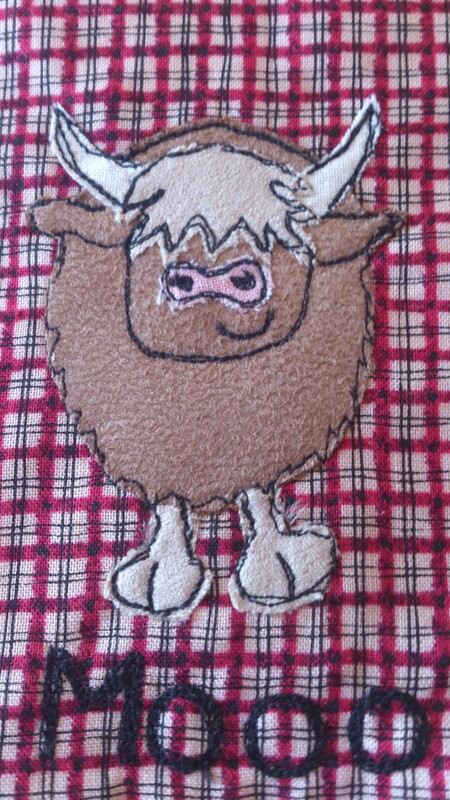 8yo's suggestion was a highland cow, a suggestion that I initially thought was too difficult to reproduce on such a small scale. I gave it a try though, and managed to at least make it recognisable. Unable to think of a complementary design for the reverse of the purse, I went for a literal translation and put the back of the cow on the back of the purse! 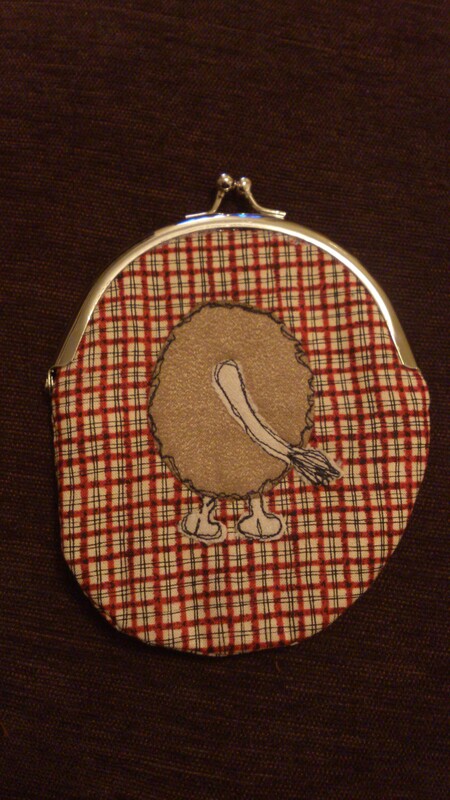 Happy with the result, I then followed it with a sheep purse. Perhaps we will move on to the rest of the farmyard at a later date. In an attempt to make up for the last month of silence, I will be posting entries to show you the work that has kept me away from the blog for so long. Today it is Kindle Cases. I have tried to theme the cases towards books, one on Pride and Prejudice, one on Alice in Wonderland and the last one on books in general. This is something that would appeal to me as a buyer and I have not seen it done elsewhere. 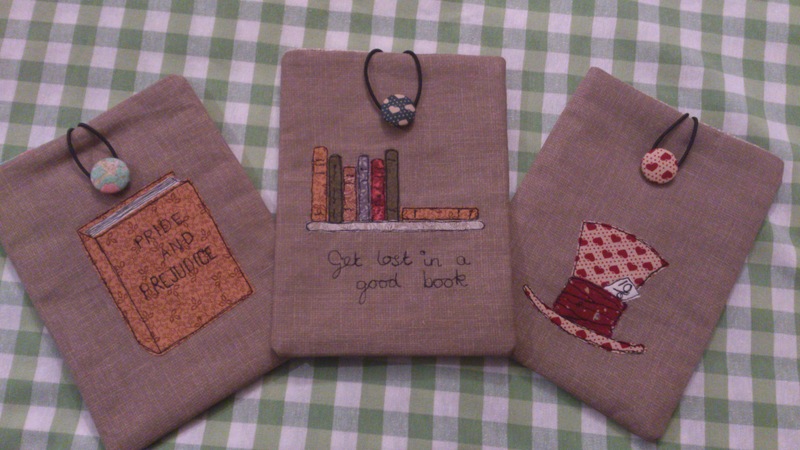 As you can see from this photo of the backs, I have tried to incorporate detail from within the books. Oh no, despite my best intentions, I haven't posted to this blog for a month now! In my defence, I have been ridiculously busy all month but now that October is almost over, it is time to get on with the blogging. 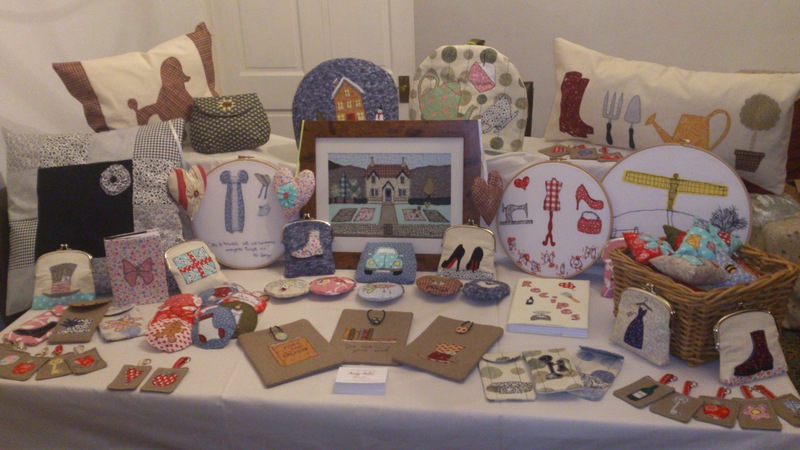 My most exciting news is that I have a stall at my first craft fair next Saturday (3 Nov). I will be at the Washington Arts Centre from 10am to 3.30pm and am hoping for a good turn out. We did a mock up of my stall layout last night and this was the best version that we came up with. I like this look, but it also incorporates most of my stock. If I am really lucky and people do buy a decent amount of my items, I have nothing to put in the empty spaces. So I have decided that I will try to make a substantial amount of additional stock in the next week so that I have some flexibility. My 12yo will be my assistant on the day and is taking her role very seriously. She has now written me a number of lists to keep me in line. I am very lucky to have such supportive family who are helping in every way possible, now I just need to sell, sell, sell! This week I have been putting together my first framed piece which will be a picture in its own right. I was a bit nervous to make something that had no other function than to be decorative. 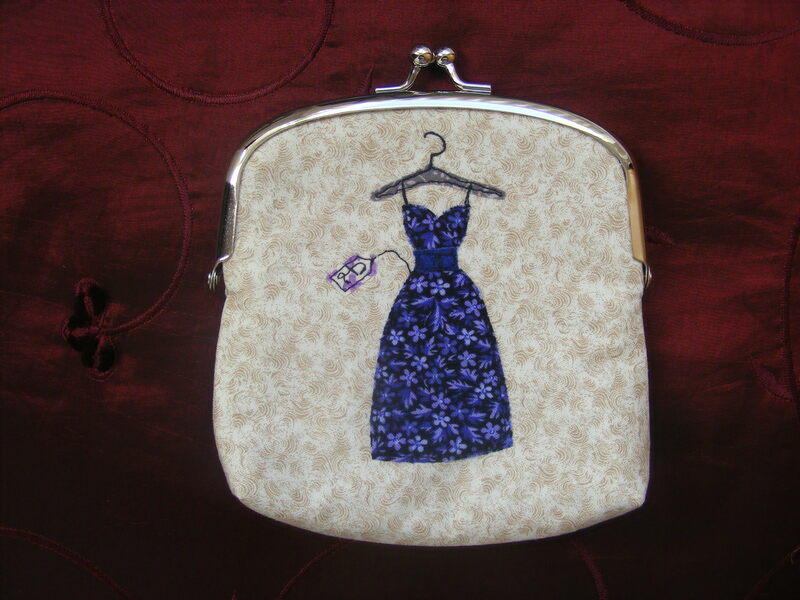 Everything else has been decoration on an item that already had a purpose - purses, cushions, phone cases etc. 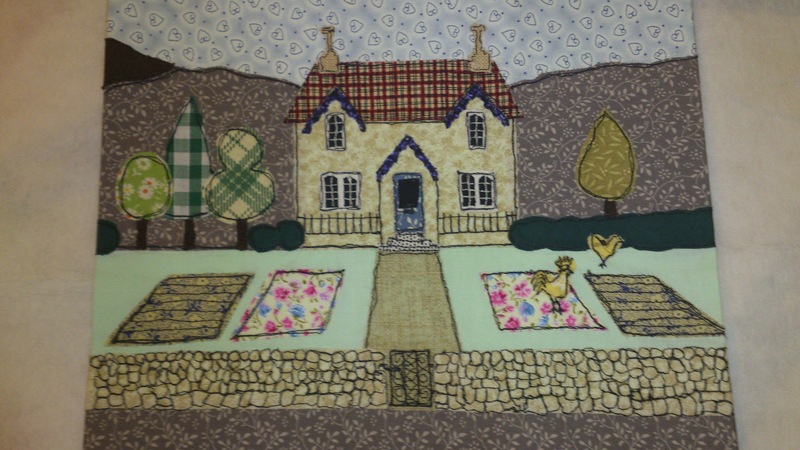 I have done some embroidery hoop framed pictures, but they have been a collection of small images rather than a scene. Hence my worry that a picture would have to stand up in its own right with sufficient detail and interest. I am quite pleased with the way it turned out and may still add more detail in the next few days. I have had a suggestion that sheep on the hill would be a nice touch. I also think the green in the foreground could do with some more detail. 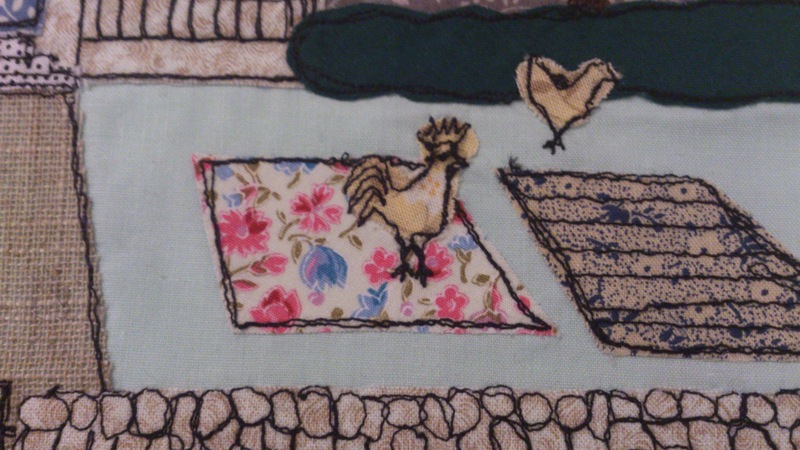 Then again, it may be too busy if I add too much, wouldn't want to detract from those fabulously artistic chickens! 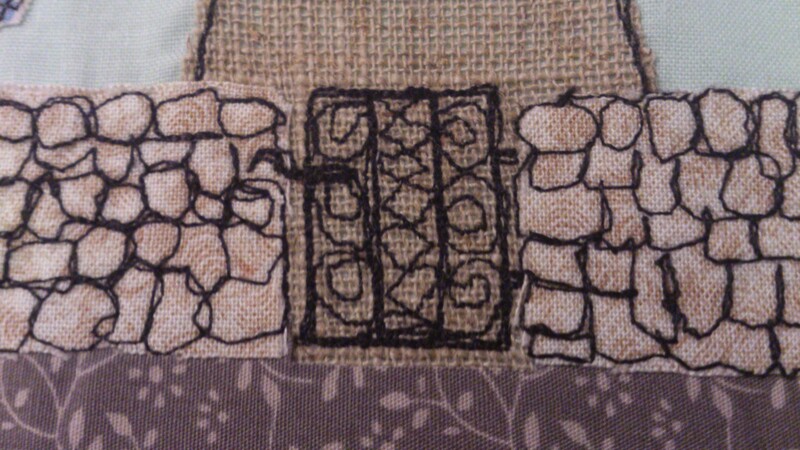 The details were particularly enjoyable to do, although the dry stone walls seemed to take forever to do. 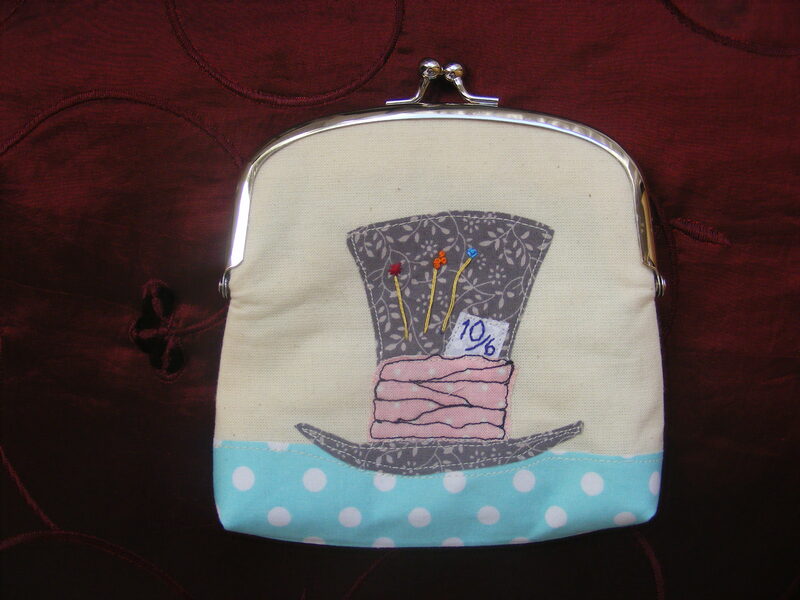 I haven't worked out how I have managed to love sewing for over 30 years and have only just discovered free motion embroidery or as Kirsty Allsopp calls it 'the crack cocaine of craft'!!! 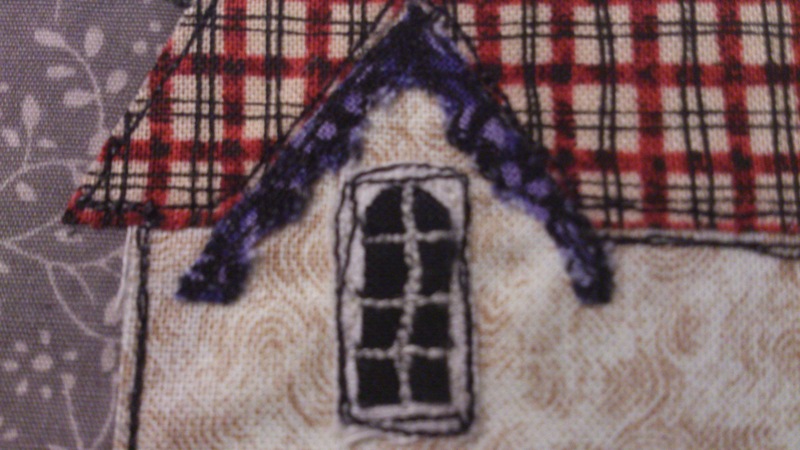 It is so lovely to not have to be exact and to be able to just 'paint' on the fabric. Kirsty is right, it is completely addictive. This week has been purse making week. I have had a lovely time designing and making these pretty things and found them to be much easier than I expected to make. 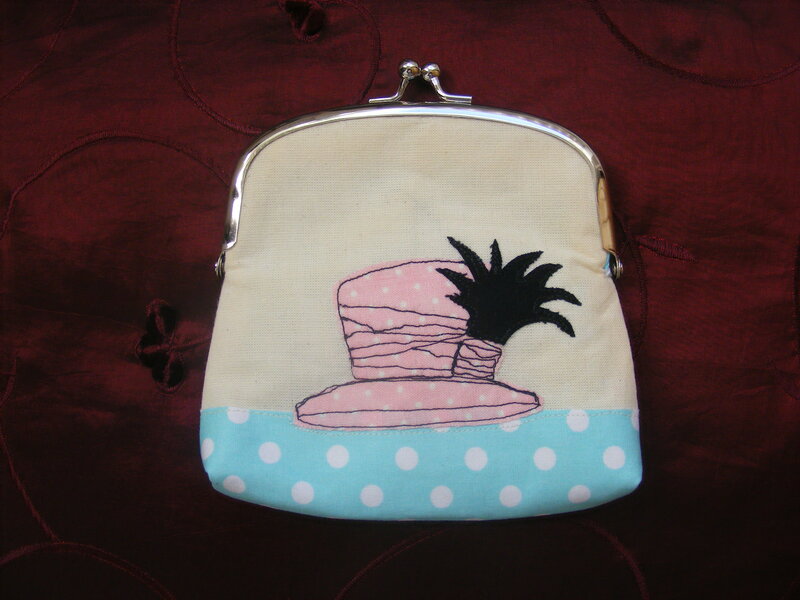 I was helped massively by one particular blog post Purse Frames De-mystified by the fabulous Lisa Lam who is the Oracle on all things bag and purse related. This first set of purses are all in some way fashion related (this was totally unintended, they just turned out that way). 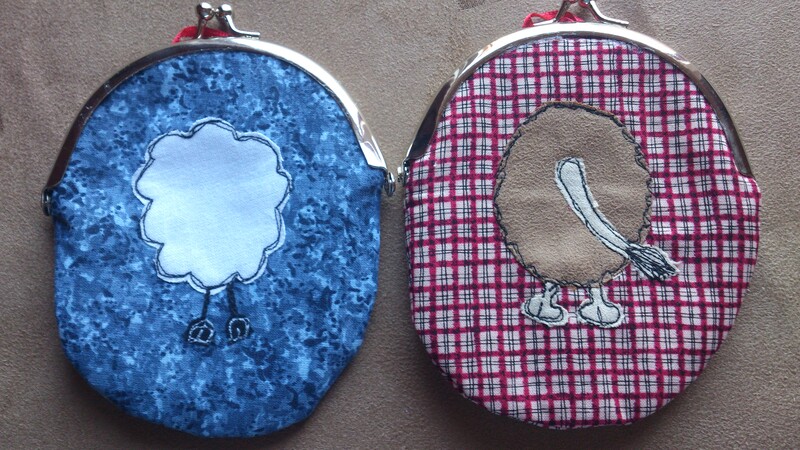 They are made with silver 125mm purse frames with either a cotton or calico cotton background. 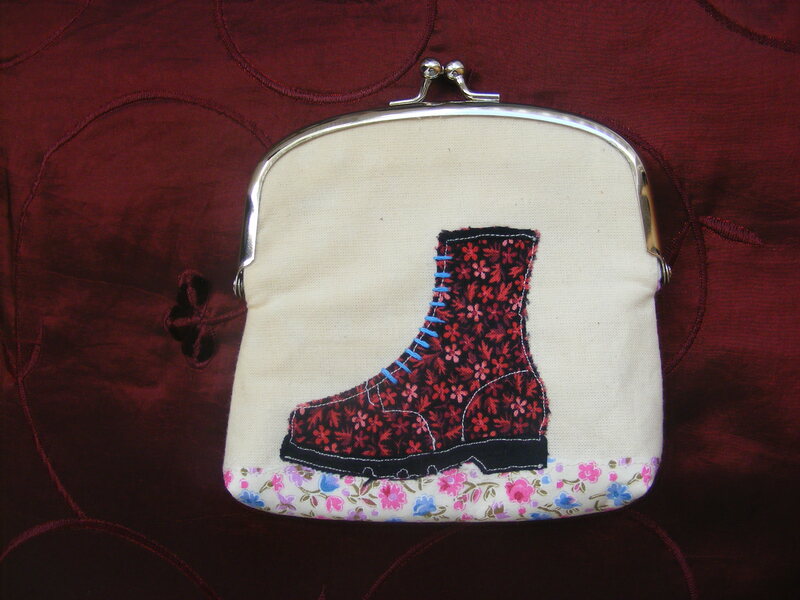 The images are applique pieces, enhanced with free motion embroidery. 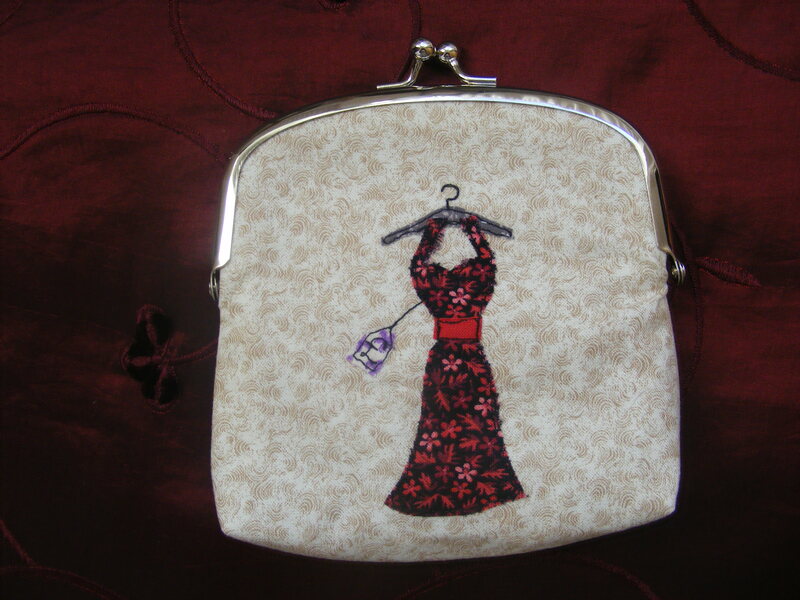 Each purse has a different design on the front and back and most are linked in some way. The design above 'Going Out' has a clutch bag design on the back. All of the purses are lined with a complementary cotton fabric, usually featured on the outside in some way, so creating a linking theme. 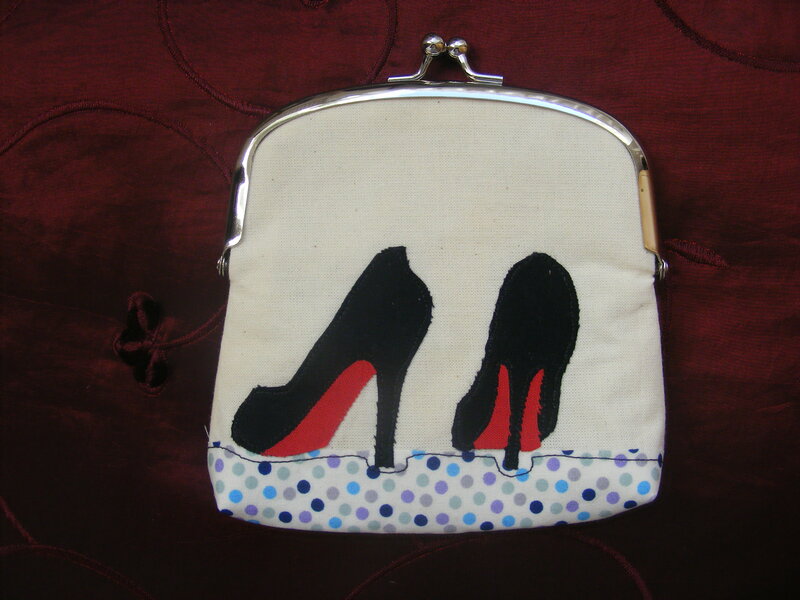 I have already had interest in a couple of the purses, so I think it is time to start designing more.............. 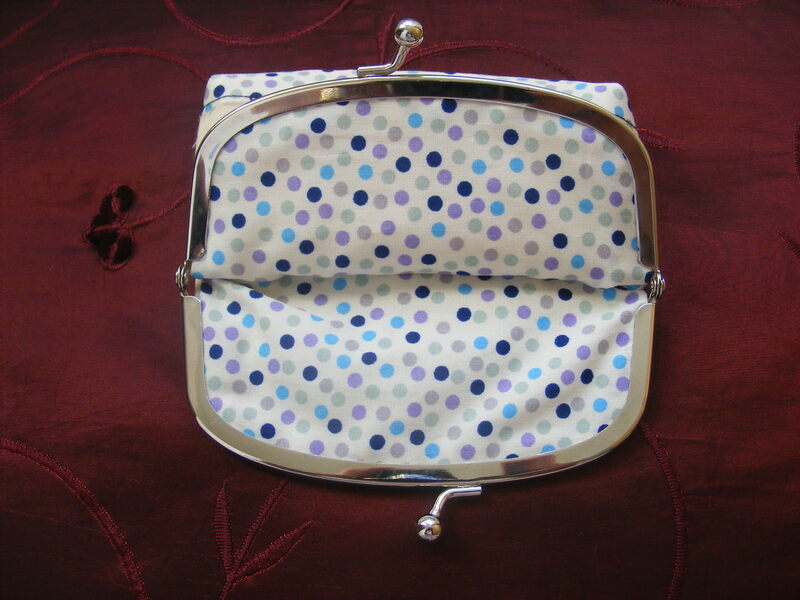 I think the next lot will be a smaller purse frame and possibly in a rounder shape. 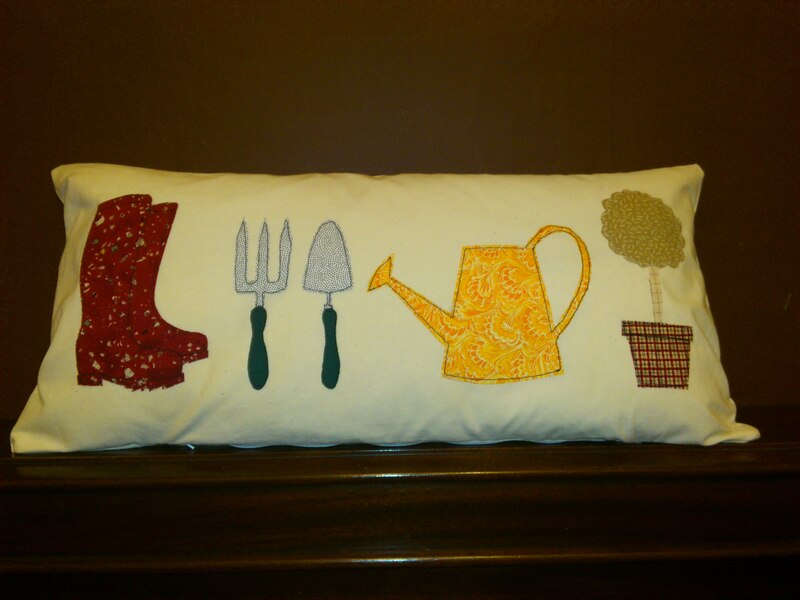 This cushion was inspired by my Dad's allotment. I thought something for gardeners would be nice. 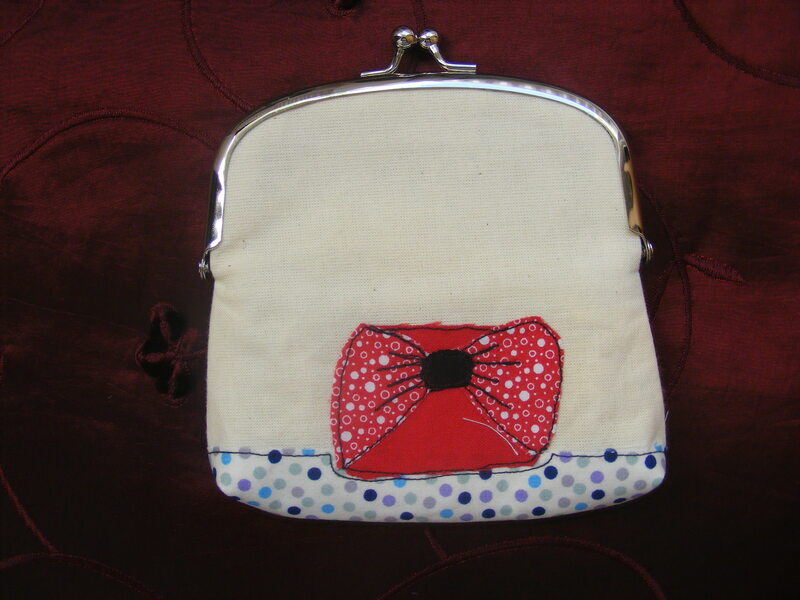 The cushion is made from cream calico cotton and has the motifs added in applique. I have done very simple embroidery on this piece with very little embellishment as the shapes are very distinctive in their shapes. 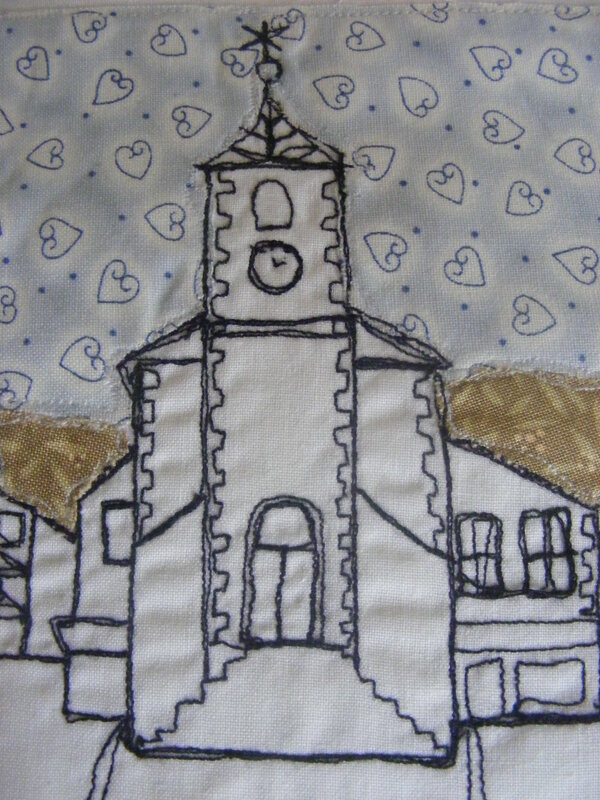 I really like to draw buildings to decided to try and incorporate one of my favourite buildings in my next piece. 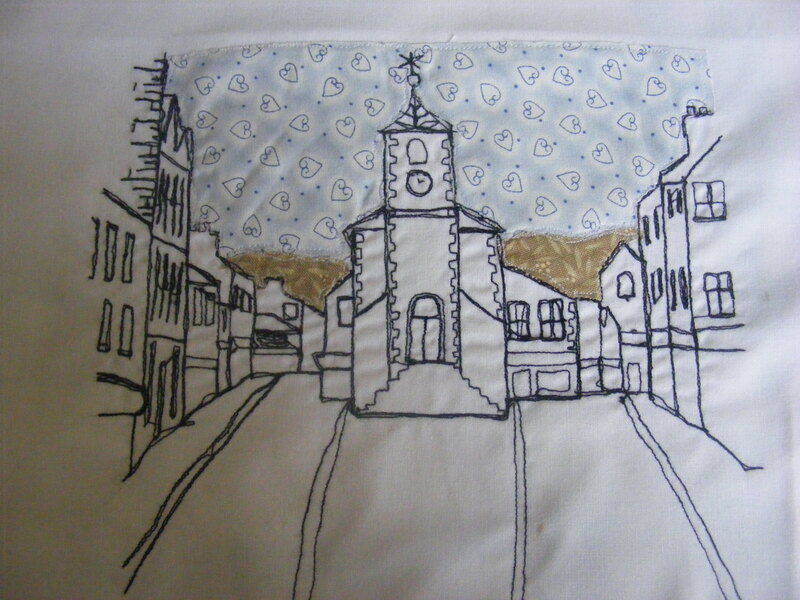 This is Moot Hall in Keswick and after sketching an outline, I used a little bit of artistic licence to add the surrounding street details before starting to embroider. Overall, I liked the result but will need to practice more before these types of picture are up to a sellable standard.